Buechat Womens Crawl C200 is a superbly designed and feature-packed open water swimming, triathlon, and free diving wetsuit backed by their 65 years in the water. The c200 is best suit to those looking for a swimming wetsuit that reduces drag with it’s Excellium smooth-skin outer jersey, keeps you in an ideal streamline with the Actifilift panelling and most important: keeps you warm, thanks to the semi-dry zipper and Elaskin X neoprene. 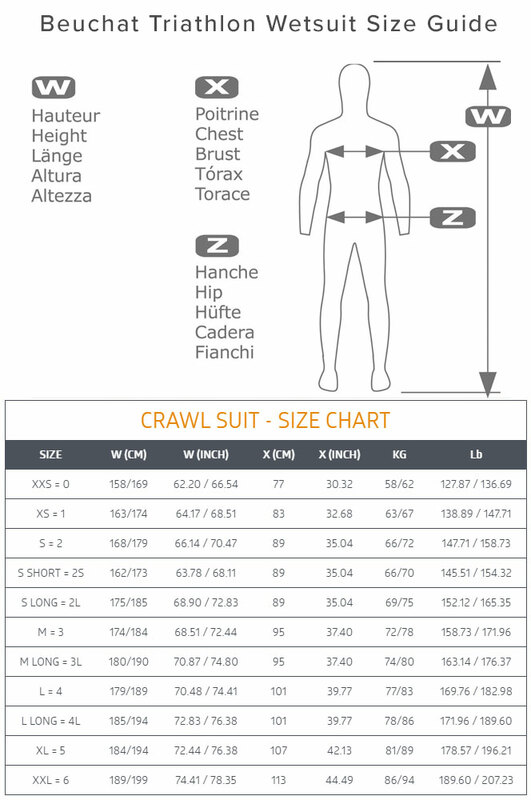 The Crawl C200 utilises decades of R&D and combines it with contemporary triathlon and open water swimming wetsuit requirements to create fantastic value and performance without negating comfort. The key aspects that define a triathlon specific wetsuit are buoyancy, hydrodynamics and low-resistance on your swim stroke. Buoyancy is a huge part of a triathlon wetsuit in that the suit can be optimised by considering each panel’s affect on your anatomy and stroke. The Beuchat Womens Crawl C200 boasts their Actiflift system to optimise buoyancy. This careful consideration allowed Buechat to create a suit with ideal stability to help you maintain proper streamline and to reduce drag - the more buoyant a wetsuit, the higher you are in the water, therefore you have to push less of your body through the water. By adding buoyancy to the lower leg panels the suit helps keep your legs high in the water, where they can be most efficient. Actiflift plays on the stabilising idea behind catamarans and they achieve this in the C200 by optimising later and front-side buoyancy. This very notion of lift and drag are why FINA banned the Speedo LZR swimsuit - but also, the LZRs were so tight that they squished your body into a smaller proflle, reducing their resistance even further. The dark side to buoyancy is that to get more of it, you need to either get thicker neoprene or induce more ‘gas’ into the core material during the production stage - the gas filled closed-cells are what make neoprene the material that is. The issue we face , not just with the Beuchat C200 Triathlon suit, but all wetsuits is that thicker neoprene has less elasticity then thinner neoprene therefore adding buoyancy by way of thickness only makes it harder for you to swim, because now you’re expending energy on simple stretching the wetsuit itself. This is where Elaskin X comes into it’s own as it gives Beuchat the tools to add buoyancy without straining your swim-stroke. They’ve laid thin neoprene around your arms, shoulders and torso, providing the most amount of flex to your stroke but lay warmer and more buoyant neoprene in the zones of lower elongation. Hydrodynamics play a bigger role in a triathlon wetsuit than in any other type of wetsuit but creating a hydrodynamic suit is essentially a material choice, not a design function. The Beuchat Women’s Crawl C200 triathlon wetsuit features their long awaited Exclellium smooth-skin. It is a somewhat typical smooth-skin in that it drastically reduces the friction compared to typical wetsuit jerseys, such as nylon and lycra. These woven jerseys, on a micro scale, have undulations that create drag but these materials can take on water, whereas smooth-skin coated jerseys do neither of those things. The hydrophobicity of this material has the added bonus of drying incredibly fast, because water/moisture can’t stick to the outside of the suit. Wind chill is 25x more effective on a wet membrane than it is a dry. No premium quality trathlon/open water swimming suit would be complete without a fully sealed seam. Sealed seams help stop cold-water from entering the suit through the seam, in turn creating more drag and making it harder for your body to retain core warmth - which increases energy consumption. This most commonly occurs when you’re bodies movement creates low-pressure pockets in the suit, in-turn creating the suction that pulls the cold water in. The Womens C200 triathlon suit’s seams are stitched to ensure no pin-holing, because the needle is hook-like. In addition to the sealed seams, Beuchat have used their 3C collar (Closing-Comfort-Collar) that easily sticks to your neck. The Beuchat Womens CRAWL C200 Tri Wetsuit treats each panel as an individual, ensuring every panel is idealised for triathlon and open water swimming. Thicker panels are laid where you need warmth and stability, thinner neoprene is laid where you need stretch. We touched on how thickness affects performance above, in the buoyancy section. Get the best performance out of your Beuchat Womens CRAWL C200 Tri Wetsuit Wetsuit Wash and have a read of our matinenance guide. Actilift: Beuchat's system to assist the swimmer in terms of stability by way of laying more buoyant neoprene on the sides of the suit, like a catamaran, sort of. This also works to reduce drag by elevating your swimming position higher. Elaskin X: Beuchat's specialised neoprene based on 60 years of development. Although this neoprene is the basis for their Scuba Diving and Spearfishing wetsuits, it affords modification of the internal cell-structure to optimise a given panel for a specific purpose. Excellium: The Crawl C200 Womens Triathlon suit is completely coated in Excellium, a smooth-skin lining that negates most suit-derived friction and drag. Furthermore, a smooth-skin coat like Excellium is a hydrophobic and dries in a heartbeat. 3C Colllar: The inverted velcro ensures to least amount of rubbing without cutting corners on the seal. Simple, comfy and effective. Semi-dry zip: ﻿The C200's zip is similar to most semi-dry zippers in that the teeth of the zip is off-set to make it more difficult for water to find a path of entry into the suit itself.